These days no organization can completely avoid dealing with third parties, which by doing so gives them a competitive advantage, lesser cost, and ultimately increase profits but these relationships present one with multiple risks. With the threat of security breaches, supply chain disruptions, data theft, or reputational damage stemming from third-parties, it is essential for any organization to take third-party management seriously since these sort of issues could have dire effects on your organization. Take comprehensive measures to mitigate third-party risk, especially those introduced by vendors that you work with regularly. By doing so, it will help your organization protect confidential data, enhance supply chain security, maintain high performativity, and effectively address disruptions. It is a fact that any organization entering into a direct contract with a vendor must require the latter to fulfill certain requirements. These include matters of operational effectiveness, data security, and corporate oversight — which makes sure that the vendor has controls in place that mitigates risk for your organization. The relationship is crystal clear in that the vendor provides you with a service or good in exchange for something in turn. Relationships are clear-cut and agreed upon in unambiguous terms for both parties. It is much easier to get information from direct vendors as opposed to other third-parties which with you might not have a relationship. You can solicit from your vendor’s information security questionnaires, inquire about their ISO 27001 certification or SOC 2 report, ask for financial information, and even conduct on-site audits. Things are not the same with all third parties. Often you may be required to give third parties access to your sensitive data and not understand the security controls that organization has in place and cannot also audit them. With the inherently unclear relationships that reign between you and other third parties, substantial risks will arise, often with serious consequences. Your organizations answer to these risks is to include these vendors in your risk management activities. Start by determining the kinds of risks introduced by dealing with each of your vendors. This information then forms the basis for verifying your controls and identify if they are adequate to the vendor’s risk. Now you can group these vendors according to their risk profile and outline appropriate steps to monitor and confront these risks head-on. Set up specific Google Alerts on your third-party vendors, be the first to know when a breach of theirs might affect you. How can I mitigate my third-party risk? Remember, when you know the kind of risks that your vendor and other third-party relationships introduce, and you understand your own organization’s risks inside out then you do not need to fear to enter into relationships with various contractors, vendors, service providers, and other third parties. Some of the risks that you need to identify: contract risks, process risks, regulatory non-compliance risks, and even political risks, undesirable events, and data systems failures. Once identified, analyze what factors drive the emergence and enlarge them. See how StandardFusion helps users identify risks, assess them and manage their mitigation efforts, all in a simple, easy to use application that increases visibility and decreases your workload. 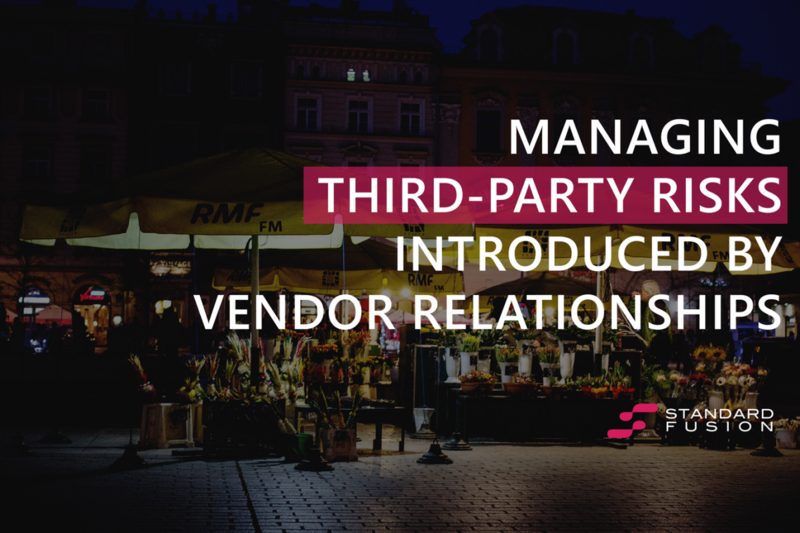 To help effectively manage these third-party risks, you have to pay attention to contracts governing your third-party relationships. Make sure contracts and service level agreements are well written with security requirements identified. Policies and controls like testing and monitoring processes should also be implemented to manage third-party relations further. Organizations who know which third-party vendors they are permitted to work with, and which ones they should be wary of, are bound to be victorious. Conducting third-party screening and effective due diligence to get an improved grasp of with who you’re likely to be dealing. Introduce this as part of your organization’s vendor approval process. A risk-based approach to screening includes categorizing third-parties according to the different types of risk they display based on their services, their location, their sites of operation, and other important aspects. The level of due diligence and screening will depend on the risk score obtained by a third party. This process of screening and monitoring of third parties should be a continuous one to provide real-time data feeds and alerts about third parties. It is crucial that they are also screened based on global regulations and law enforcement, international sanctions and watchlists, and negative media coverage. Lastly, technology plays an essential role in third-party risk mitigation. Integrated technology systems can strengthen risk monitoring, assessment, and management by providing a shared platform for managing several third parties at the same time while keeping you up-to-date on any risks and compliance issues that may arise. The automation of third-party management processes, mapping of essential third-party data, and maintaining of important documents in a unified database makes it possible to rationalize the entire process of third-party management, screening and due diligence processes, audits, and risk management. StandardFusion makes third-party risk management simple and approachable for you. Offering a sleek, minimalist design accessible from mobile or desktop devices, StandardFusion provides advanced options for compliance monitoring, due diligence, and control evaluations. Ultimately, both new users and those exposed to the governance, risk and compliance industry will take to liking StandardFusion as a comprehensible and easy-to-use tool for third-party risk management for organizations of all sizes.